A province located in the mid-eastern part of the Korean Peninsula, Gangwon-do features roughly a four-sided plain with a larger north-south than east-west portion. It is bordered by the East Sea to the east, Gyeongsangbuk-do to the south, Chungcheongbuk-do to the southwest, Gyeonggi-do to the west, Hwanghae-do to the northwest and, finally, Hamgyeongnam-do to the north. The province is surrounded by high mountains and deep valleys formed by the Taebaek Mountains running north to south on the peninsula. About 82% of the province is comprised of mountainous areas. 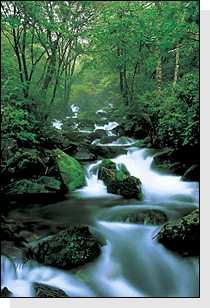 Gangwon-do spouts the headwaters of the three longest rivers in South Korea,: Namhan River, Bukhan River and Nakdong River. The area also provides Korea's most scenic mountains, such as Geumgang Mountain, Seorak Mountain, Odae Mountain, Taebaek Mountain and Chiak Mountain. The rich natural wealth of today's Gangwon-do attracted human settlements in Korea's earliest history and gradually formed a tribal state called Yaemaek when Korea was in the Gojoseon Period (2333 BCE - 108 CE). The area was briefly under the influence of Baekje, during the Three Kingdoms Period (c. 1st c. BCE - 668), when the kingdoms established a centralized authoritarian rule to effectively control their regional areas. It was then ruled by Goguryeo, between the 3rd and 5th centuries, when the kingdom reached the zenith of its power. It was next ruled, from the 6th century, by Silla when it emerged a major power on the peninsula. It was in 685, the 5th year of the Silla King Sinmun's reign, when Silla established the Nine Provinces (Ju) in an effort to ensure the effective rule of its territory. This followed its dramatic expansion with the unification of the Three Kingdoms, when Gangwon-do began to appear in Korean history as an administrative subdivision with clearly defined geographical borders. The Nine Provinces of Unified Silla are Sakju, Myeongju, Hanju, Ungju, Sangju, Jeonju, Muju, Gangju and Yangju. Today's Gangwon-do then consisted of two provinces, Sakju which corresponds mostly to today's Yeongseo region and Myeongju which corresponds to today's Yeongdong region. These were then subdivided into 21 counties (Gun) and 51 prefectures (Hyeon). A special administrative unit called Bugwongyeong ("Northern Region Capital") was in the jurisdiction of Sakju. The counties and prefectures under the Unified Silla's two provinces, Sakju and Myeongju, are shown in Table 1 below. As shown in Table 1 above, the area of Sakju, which had 12 counties and 26 prefectures in its jurisdiction, contained today's Hoengseong to the east, Gapyeong in Gyeonggi-do to the west, Yeongju of Gyeongsangbuk-do to the south, and Deogwon in Hamgyeongbuk-do. Its provincial capital was seated in today's Chuncheon. As for Myeongju, (with the capital was in today's Gangneung,,) the area contained nine counties and 25 prefectures bordered by the East Sea to the east, Yeonghae, Yeongdeok and Cheongsong in Gyeongsangbuk-do to the south, Pyeongchang and Jeongseon to the west, and Anbyeon in Hamgyeongnam-do to the north. Therefore, Gangwon-do, under Unified Silla's nine-Ju system, contained the coastal areas to the east; the area linking Yeongdeok, Cheongsong, Yeongju and Punggi in Gyeongsangbuk-do to the south; Danyang and Jecheon in Chungcheongbuk-do; Wonju, Gapyeong and Cheorwon to the west and Deogwon, Anbyeon and Hoeyang in Hamgyeongnam-do to the north. This shows that Unified Silla's two provinces, Sakju and Myeongju, included in its jurisdiction not just today's Gangwon-do but some of Gyeongsangbuk-do, Chungcheongbuk-do and Hamgyeongbuk-do. The two provinces consisting of 21 counties, 56 prefectures and 1 secondary capital (Sogyeong) faced drastic change in the following Goryeo Period (936-1932). Goryeo unified the Three Later Kingdoms in 936, but the new dynasty still had many years until it got its regional areas under the control of the central government. King Taejo, who founded the dynasty, and despite being the king, found his authority gravely limited as many of the regional areas were under the control of independent warlords who defied the rule of the central government. It was during the reign of King Seongjong that the Goryeo Dynasty strengthened its royal authority and began to send administrators for effective rule over the entire territory. In 983, King Seongjong established central governmental organizations, divided the kingdom into 12 provinces (Mok), and began to send local administrators to impose direct, centralized rule. Before the introduction of the 12-Mok system, the dynasty's central government and the regions were largely connected by three officials, titled Geumyu, Jojang and Jeonunsa dispatched from the central government. The main duty of Geumyu and Jojang was the collection of taxes and tributary goods whereas that of Jeonunsa was the transportation of the collected taxes and tributary goods from the regions to the capital of Goryeo. The 12 provinces of Goryeo were Gwangju, Yangju, Chungju, Cheongju, Gongju, Jinju, Sangju, Jeonju, Naju, Seungju, Hwangju and Haeju. The provinces were ruled by the governors dispatched from the central government. The governors’ main duties also included controlling the local powers. The Goryeo rulers also had two special administrative units (Gye) for the northern border regions, Seobukgye ("Northwestern Region") and Dongbukgye ("Northeastern Region"), where they sent military commanders titled Jujinsa. To sum, the administrative divisions of early Goryeo largely consisted of the 12 provinces (Mok), for which administration focused on civil affairs, and the two border regions (Gye), where defense and military affairs formed key administrative factors. Table 2 below shows a comparison of today's Gangwon-do under Goryeo's 12-Mok system and Silla's nine provinces (Ju) and five secondary capitals system (Sogyeong). Table 2 shows that the 12 Provinces of Goryeo were made either by maintaining the existing strategic points or establishing new strongholds all across the southern part of the kingdom. The provinces in today's Hwanghae-do were all newly established. The early administrative divisions in Seobukgye (today's Pyeongan-do) and Dongbukgye (today's Gangwon-do), which included Sakju, Myeongju and Bugwon-gyeong, no longer existed, but no detailed records remain to explain the changes. The reform of the administrative divisions made in 983, the 2nd year of King Seongjong's reign, reveals that it was largely related with the southern part of Goryeo as there was no significant change made regarding the two border regions in today's Gangwon-do and Pyeongan-do. Yeongju, the strategic outpost built to protect the northwestern border region against invasion by the Khitan forces was governed by Anbuk Daedohobusa ("Commander of the Great Regional Protection in Anbuk"). Meanwhile, other key military outposts, such as Sunju, Wiju, Eunju, Sukju and Jaju, were governed by Bangeosa ("Border Defense Officer"). Myeongju in the Northeastern Border Region was changed to Haseo-bu. The dualistic administrative division system of Goryeo, marked by the 12 provinces (Mok) in the south and the two border regions in the north, suffered a drastic change in 995, the 14th year of King Seongjong's reign, as the dynasty adopted the Military Governor (Jeoldosa) system from Tang China and the Ten Provinces (Do) system. The change from the 12-Mok system focused on civil administration by the Jeoldosa system. Priority was given to military rule and led to the establishment of 12 Military Governor Offices in the 12 Provinces (Mok). Also there was the dispatch of 80 "Outer Officials" (Oegwan), including two Yusu, five Dohobusa, seven Dodallyeonsa, 11 Dallyeonsa, 15 Jasa, 21 Beongeosa and seven Jinjang to other administrative units. To today's Gangwon-do area, the Goryeo Dynasty sent a total of seven Outer Officials and five Training Officers (Dallyeonsa) to Gyoju, Chunju, Dongju, Myeongju and Cheokju, and two Border Defense Officers (Bangeosa) to Joju (Goseong) and Yeonju (Sakju). Such change eventually led to administrative reform in which the entire kingdom was divided into 10 provinces (Do): Gwannae-do, Jungwon-do, Hanam-do, Gangnam-do, Haeyang-do, Yeongdong-do, Yeongnam-do, Sannam-do, Sakbang-do, and Paeseo-do. The provinces were then subdivided into 128 counties (Ju), 449 prefectures (Hyeon) and 7 military outposts (Jin). It was Sakbang-do, consisting of seven counties and 62 prefectures, which occupied the area of the present Gangwon-do. The introduction of the 10-Do system by the Goryeo Dynasty, however, couldn't keep the Outer Officials in the counties and prefectures from becoming the central players in regional administration. The new administrative division of the kingdom into 10 provinces, according to their geographical features, was intended to reform the indefinite and provisional divisions of early Goryeo. These provinces were controlled by Jeonunsa, involved sending an official from the central government to oversee the transportation of taxes. The political influence of the Outer Officials, including the 12 Military Governors (Jeoldosa), continued to remain strong. following the reform, leaving the new 10 provinces to fail in their role as the top regional administrative organizations controlling the counties and prefectures. The situation led the 10 Provinces not to the role of the kingdom's largest administrative divisions effectively linking the capital with the regional areas but to the much simpler roles of transporting taxes and policing. In sum, the 10-Do system helped the Goryeo Dynasty gradually move from the earlier 12-Mok system to more systematic administrative divisions. This contributed to the consolidation of its central government. Unfortunately, however, it never succeeded in fully replacing the earlier system by the new organizations. The Jeoldosa-based administrative system adopted in 995 by King Seongjong came to face a major change in 1005, when King Mokjong (r. 997-1009) abolished the existing administrative units andpositions with the exception of: the 12 Military Governors (Jeoldosa) and the four Regional Protection Commands (Dohobu) in the south; and the Border Defense Officers (Bangeojinsa), Prefects (Hyeollyeong), and Outpost Commanders (Jinjang) in the northwestern border region. With this reform, the dynasty came to focus more on civil, rather than military, affairs. In 1012, the dynasty, under the King Hyeonjong's rule, replaced the Governor of the Eastern Capital (Donggyeong Yusu) witha Border Defense Officer (Bangeosa) and the 12 Military Governors with five Regional Protection Commands and 75 Defense-Police Officers (Anmusa). Then, in 1018, the Defense-Police Officers were abolished and the regional administrative system reorganized to consist of four Regional Protection Commands, eight Provinces (Mok), 56 County Heads (Jiju Gunsa), 28 Outpost Commanders and 20 Prefects. After the reformation, the defense-focused Jeoldosa system consisted of civil administrative divisions, such as Mok and Jiju Gunsa in the east, and defense-focused divisions, such as Bangeosa and Jinjang in the border region. The reform made in the 9th year of King Hyeonjong's rule increased the number of Outer Officials to116 from 80 (in the 14th year of King Seongjong's rule,), contributing to the establishment of the Outer Officials system and consolidation of the central authority. One of the last major reformations inGoryeo's administrative divisions took place under the rule of King Hyeonjong by which the kingdom was divided into the Capital Area (Gyeonggi), Five Provinces (Do) and Two Border Regions (Gye). These large administrative units were then divided into four capitals (Gyeong), four Regional Protection Commands (Dohobu) and eight Subprovinces (Mok), which were, in turn, subdivided into 15 Counties (Bu), 129 Subcounties (Gun), 335 Prefactures (Hyeon) and 29 Military Outposts (Jin). The five provinces under the reformed system were Yanggwang-do, Gyeongsang-do, Jeolla-do, Gyoju-do and Seohae-do, while the two Border Regions were Donggye ("Eastern Border Region") and Bukgye ("Northern Border Region"). As for the current Gangwon-do, much of the Yeongdong area east of the Taebaek Mountains and the area below Jeongpyeong in Hamgyeongnam-do were under the jurisdiction of Donggye, while most of the Yeongseo area, excluding some parts in the south, were part of Gyoju-do. As for two of Goryeo's largest administrative divisions that would form today's Gangwon-do, Donggye consisted of one Dohobu, nine Gun, eight Hyeon, 10 Jin and 17 Subordinate Prefectures (Sokhyeon), while Gyoju-do consisted of three Gun and 25 Subordinate Prefectures. The central government of Goryeo, since its middle period, had continued to dispatch governors (Anchalsa) to the Five Provinces and military commanders (Byeongmasa) to the two border regions, thus maintaining the civil-military dual administrative system until the last phase of its period. Following the coronation held at Suchanggung Palace in Gaeseong on the 17th of July 1392, following the foundation of a new dynasty, Yi Seong-gye as the founder and first ruler of the dynasty promulgated an edict that he would continue to use the name Goryeo for his dynasty and follow the ceremonies and legal systems of Goryeo in an effort to secure political stability. Once he gained political stability, however, King Taejo decided to move the capital to a new site, implement the Rank Land Law (Gwajeonbeop), and reorganize the administrative divisions of Gyeonggi-do and, accordingly, the administrative divisions for the rest of the country. In June 1394, two years after the launch of Joseon, King Tajo proposed a reform of the administrative divisions to the Council of State Affairs (Dopyeonguisasa), resulting in Gangneung-do andGyoju-do being combined to create Gangwon-do. The official launch of Gangwon-do, created by merging Gangneung-do in the Yeongdong area and Gyoju-do in the Yeongseo area, took place a year later. The administrative divisions of Gangwon-do, following the confirmation of its name, were arranged as part of the effort to give it an adequate shape by exchanging Yeongchun, a subordinate prefecture in Wonju, with Yeongwol, which had been under the jurisdiction of Chungju in Chungcheong-do in 1399, and Gapyeong and Jojong with Icheon in Gyeonggi-do in 1413. One of the last major changes in the province's administrative division took place in 1434, (the 16th year of King Sejong's rule,), when the government put Cheorwon and Anhyeop under the jurisdiction of Gangwon-do in order to relieve them of the heavy burdens imposed on them by the central government. Meanwhile, the series of reforms made in Joseon's administrative divisions, after the implementation of the Rank Land Law, also involved reorganization of local administrative systems based on the historical traditions and geographical features of each regional area. It was in 1413, (the 13th year of King Taejong's reign,), when Joseon established the eight-Do system in which the entire kingdom was divided into eight Provinces (Do): Jeolla-do, Gyeongsang-do, Chungcheong-do, Hwanghae-do, Pyeongan-do, Yeonggil-do (later Hamgyeong-do) and Gyeonggi-do. Gangwon-do in 1830 (the 30th year of King Sunjo's reign,) was: 300 li (approx. 118 km) wide, from east to west, and 800 li (approx. 315 km); its jurisdiction from Wonju, the seat of the provincial capital at the time, extended 310 li (approx. 122 km) to the coast of Gangneung in the east, 70 li (approx. 28 km) to Jipyeong in Gyeonggi-do in the west, 525 li (approx. 207 km) to Tosan in Hwanghae-do in the northwest, 50 li (approx. 20 km) to Jecheon in Chungcheong-do in the south, and 597 li (approx. 235 km) to Anbyeon in Hamgyeong-do in the north. According to The Geographical Records in the Annals of King Sejong (Seong Sillok Jiriji) compiled in 1454, (the 2nd year of King Danjong's reign,), Gangwon-do's administrative divisions and subdivisions were one Daedohobu (Gangneung), one Mok (Wonju), four Dohobu (Hoeyang, Yangyang, Chuncheon and Samcheok), seven Gun (Pyeonghae, Tongcheon, Jeongseon, Goseong, Ganseong, Yeongwol and Pyeongchang), and 11 Hyeon (Geumseong, Uljin, Heupgok, Icheon, Pyeonggang, Geumhwa, Nangcheon, Hongcheon, Yanggu, Inje, and Hoengseong). In The Great Code of the National Government (Gyeongguk Daejeon), published in 1474 (the 5th year of King Seongjong's rule,), the province incorporated Cheorwon and Anhyeop in its jurisdiction in 1434 (the 16th year of King Sejong's rule,), as Dohobu and Hyeon, respectively, resulting in one Daedohobu, one Mok, five Dohobu, seven Gun and 12 Hyeon. The Great Regional Protection Command (Daedohobu) was located in Gangneung and headed by an official with the rank of 3rd Grade Major (Jeong 3-Pum), while the Provincial Administration (Mok) was in Wonju and headed by another official with the rank of 3rd Grade Major. In addition, Regional Protection Commands (Dohobu), headed by 3rd Grade Minor (Jong 3-Pum) officials, were situated in Hoeyang, Yangyang, Chuncheon, Cheorwon and Samcheok; county (Gun) administrations, with 4th Grade Minor chiefs, were situated in Pyeonghae, Tongcheon, Jeongseon, Goseong, Ganseong, Yeongwol and Pyeongchang; and prefectural (Hyeon) administrations, headed by 5th Grade Minor officials, were found in Geumseong, Uljin and Heupgok. Those headed by 6th Grade Minor officials were located in Icheon, Pyeonggang, Geumhwa, Nangcheon, Hongcheon, Yanggu, Inje, Hoengseong and Anhyeop. As shown in Table 3, among the 26 administrative units in Gangwon-do only two, Yeongwol-gun and Icheon-hyeon, were promoted to a higher unit. Yeongwol-gun was promoted to Yeongwol-bu governed by a 3rd Grade Major officer as requested by the influential statesman named Choe Seok-jeong. Choe Seok-jeong insisted in 1699 (the 25th year of King Sukjong's rule,), that "the county governor of Yeongwol should be promoted to provincial governor because he needs to be appointed as a major wine offerer at the Jangneung Royal Tomb." It was in the previous year that the Joseon Dynasty posthumously promoted Prince Nosangun to King Danjong, and his tomb in Yeongwol to the Jangneung Royal Tomb. As for Icheon-hyeon, it was in February 1608, when Prince Gwanghaegun was enthroned following the death his father, King Seonjo, when he was promoted to Icheon-bu governed by a 3 Grade Major official. This was because it offered the crown prince a shelter where he could establish and run a government agency to comfort war-troubled people during the Imjin Waeran, the seven-year war waged between Joseon and Japan following the Japanese invasion of Korea in 1592. While there had been minor changes in the status of its administrative divisions, Gangwon-do maintained the 26-unit system until 1895, the 32nd year of King Gojong's reign, when the Joseon Dynasty abolished the eight-Do system to adopt the 23-Bu system.